JR Fibreglass Industries Private Limited - Manufacturer of gas scrubbing system, fume extraction and scrubbing system & emergency scrubbing system for chlorine sheds in Mumbai, Maharashtra. Gas scrubbers are used extensively for scrubbing of toxic, corrosive and hazardous gases, vapors and particulate from industrial emissions. JRF offers a wide choice of gas scrubbing devices viz. These equipments offer a large surface area of liquid over which the gas stream flows. The liquid phase absorbs the soluble pollutant from the gas stream. Wet packed scrubbers are preferred over the other types in many applications. 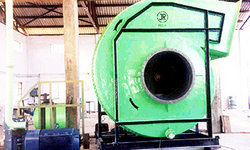 All scrubbers are designed taking into account the theories of mass transfer and heat transfer. Designed for intimate gas-liquid contact providing high absorption rate with carefully designed and precisely manufactured modem internals. Packing support plates of multi-beam gas injection type to avoid flooding. Liquid distributor designed to offer minimum restriction to gas flow and for high efficiency liquid distribution. Liquid redistributor of orifice-riser type. Packing type and size selected to allow high gas-liquid traffic with low pressure drop for the gas. Mist eliminator selected to entrap fine mist with minimal pressure drop. Recirculation tank of suitable holding capacity provided as per requirement with provision of mounting the scrubber directly on recirculation tank to save space. Recirculation pump of required capacity and head. Efficiently designed proprietary centrifugal fan of suitable capacity and static pressure. Heat exchanger designed to give required heat transfer duty wherever needed. Efficient mode of pollutant removal. Low pressure drop and minimum energy requirement. Once through or recycling operation as desired. Easy flexibility and high turn down. Maintenance free and noiseless operation. Minimum or no man power required. JR Fibreglass Industries Pvt. Ltd. has nearly three decades of experience in design and manufacture of corrosion resistant equipment and systems for the processing industries. Today JR Fibreglass enjoys a high reputation for providing innovative technology in air pollution control, particularly in fume extraction and scrubbing of toxic, corrosive and hazardous gases. Chlorine is extensively used as a reacting gas for manufacture of Chlorinated organics, dyes, pesticides and as oxidizing agent in the water treatment. Chlorine sheds store the desired number of tonners which must be provided with ventilation and exhaust system to carry and treat the leak chlorine gas. JR offers customized packages for emergency leak exhaust and scrubbing system for chlorine sheds. Efficient suction and carriage of leak gas. Mist eliminator to entrap fine mist with minimal pressure drop. 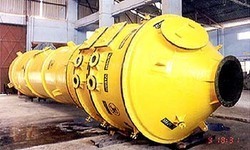 Recirculation tank of suitable holding capacity provided as per requirement. Jr fibreglass industries pvt. Ltd. Has an experience of three decades in manufacturing custom built fans with tailor made design. We have standardized various fan models to suit different volumetric flow & pressure requirements. impellers made out of frp using various grades of resin. option of different drive arrangements. option of different direction of rotations. total indigenous solutions to your suction requirements. browse through the graphs of individual models & select your model. select drive arrangement. (in case of 2850 & 1440 rpm you have a choice of direct driven / direct coupled arrangement). frp using various grades of resin like vinyl ester, super vinyl ester, bisphenol, isophthalic etc. composite materials like pp/frp, pvc/frp pvdf/frp, ectfe/frp etc. jr fibreglass industries pvt. Ltd. Has more than 30 years of experience in design & manufacture of corrosion resistant equipment and systems for the processing industries. Managed by a team of technical experts with modern facility for plastic fabrication and in-house quality control set up, we produce unmatched quality products for most of the renowned companies regularly. chemical, pickling plants, pharmaceutical, dyes & intermediates, pesticides & agrochemicals, chlor – alkali, paper & pulp, fertilizers, textiles etc. jr offers its services for design, fabrication & installation of complete acid / chemical handling system with guaranteed performance. 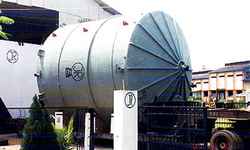 Jr tanks and vessels are used extensively for storing / processing various toxic, hazardous & corrosive chemicals. Jr has expertise in designing complete acid handling systems. 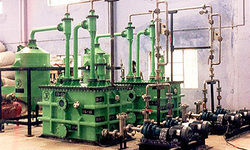 Acids is pumped from main tank to various other points of end use. Depending upon the flow requirement, we design layout and sizing of various acid carrying pipes in such way that minimum of pressure drop is required. All necessary accessories like pumps, valves, strainer, and bellows are sized to suit the requirement. Jr has executed various projects for handling of various acids. Our team of technical people can assist you in right selection of capacities & material of construction. jr tanks, vessels & piping can be fabricated from various thermoplastic & thermoset materials. with thermoplastic liner from inside as a chemical. resistance and external frp armor for strength. Named after giovanni battista venturi (1746–1822), italian physicist, it is a system for speeding the flow of the fluid, by constricting it in a cone-shaped tube. The gas is drawn into the throat of the venturi by a stream of absorbing liquid. These devices are generally used when a low pressure drop is required and where the liquid contains suspended solids, which would otherwise plug the packed or tray towers. This can be used in a single stage countercurrent mode or multistage countercurrent mode by using several venturis. Jr fibreglass industries has the capability to design and manufacture single stage and multistage venturis.